SBI Specialist Cadre Officer Previous Papers are given in this page along with the exam pattern. Download State Bank of India solved papers and commence their preparation. Also, get State Bank of India Specialist Cadre Officer Deputy Manager Model Papers along with solutions from the below sections. Great Opportunity for the candidates had applied for the vacancies of State Bank of India for the posts of Specialist Cadre Officer. We have provided the SBI Specialist Cadre Officer Previous Year Question Papers and interested aspirants can download these for the exam preparation. The officials are going to held the written exam for the candidates on 11th November 2017.By Practising Previous Papers Applicants can score high and can easily get the job. SBI Previous Papers are uploaded in PDF Format further on this page. SBI has released an official Recruitment notification for multiple positions across India. Candidates who want to settle down in the Banking Sector had applied according to their Qualification and Experience. As exam date is fast approaching, many candidates already started their preparation for the recruitment. In this post, candidates can check SBI Previous Papers, Exam pattern and also SBI Syllabus. 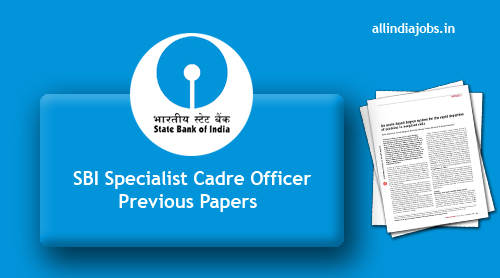 Candidates can check, download and share the SBI Specialist Cadre Officer Previous Papers with their friends. For more such jobs and materials, willing candidates can check our site All India Jobs for more updated information. Applicants who wish for these jobs can practice these papers before attending to the exam. So candidates can get a high score in the main examination and then grab the job in the Interview process. Previous papers, SBI syllabus and exam pattern provided here are just for information purpose only. Sometimes companies may change their exam pattern. So please check official company website for latest information. SBI Specialist Cadre Officer Previous Papers are for the candidates who are going to attend for the posts of Specialist Cadre Officer conducting by the State Bank of India. For every government job, there will be a tough competition and candidates can grab the job by thorough preparation. These SBI Specialist Cadre Officer Previous Papers are helpful for the applicants for the success in the examination. Right from basics to the in-depth syllabus is given below. By these candidates can get more knowledge by knowing the syllabi of the examination. Scroll down to get more information on SBI Specialist Cadre Officer Model Papers and syllabus. All the Best to the readers who are trying for the State Bank of India jobs. You should check State Bank of India syllabus 2017 before attending the exam. So that you can prepare well for the exam. State Bank of India (SBI) is an Indian multinational, public sector banking and financial services company. It is a government-owned corporation with its headquarters in Mumbai, Maharashtra. As of 2014-15, it had assets of ?20.480 trillion (US$300 billion) and more than 14,000 branches, including 191 foreign offices spread across 36 countries, making it the largest banking and financial services company in India by assets. The company is ranked 232nd on the Fortune Global 500 list of the world’s biggest corporations as of 2016. The bank traces its ancestry to British India, through the Imperial Bank of India, to the founding, in 1806, of the Bank of Calcutta, making it the oldest commercial bank in the Indian Subcontinent. Bank of Madras merged into the other two “presidency banks” in British India, Bank of Calcutta and Bank of Bombay, to form the Imperial Bank of India, which in turn became the State Bank of India in 1955. The government of India owned the Imperial Bank of India in 1955, with Reserve Bank of India (India’s Central Bank) taking a 60% stake, and renamed it the State Bank of India. In 2008, the government took over the stake held by the Reserve Bank of India. State Bank of India is a banking behemoth and has 20% market share in deposits and loans among Indian commercial banks. I Test of Reasoning 50 50 90 min. IV Professional Knowledge (PK) 50 50 45 min. Applicants who are searching for the State Bank of India previous papers can check the precise information here. To qualify for this interview, it is advisable to check the Specialist Cadre Officer posts previous papers before attending the exam. By practicing these papers you can reach your destination. There are no shortcuts to success. It is the result of preparation, hard work and learning from failure. We wishing you all the very best for your success. The SBI Specialist Cadre Officer Previous Papers are useful for the aspirants to enhance their career in this field. So kindly visit our website www.allindiajobs.in for further updates.